The National Iranian Oil Company (NIOC) has reached an agreement with the International United Petroleum and Chemical Corporation (UNIPEC) to increase oil exports to China to 500,000 barrels per day (bpd). According to the report, the deal is another sign that China has no immediate plans to obey US sanctions, which were toughened late last year to increase pressure on Iran over its peaceful nuclear activities. On the New Year's Eve, the US President Barack Obama signed into law new sanctions which aim to penalize other countries for dealing with Iran's central bank and importing its crude oil. The European Union also banned Iran oil imports by its members on January 23. Major Asian oil consumers, China, India, and South Korea, along with Iraq and Turkey have already asked for waivers on US oil sanctions against Iran. Although the terms of the new contract between NIOC and UNIPEC have not been made public, last year's contract was for 220,000 bpd of crude and 60,000 bpd of condensate from Iran's South Pars gas field. Iran's deputy oil minister headed a delegation to China this week to negotiate a new crude supply contract and other joint projects in oil, gas and petrochemicals with Beijing. 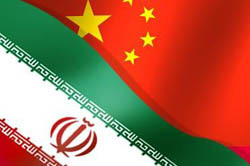 The new agreement comes following those negotiations and is expected to increase Iran's oil shipments to China to above 500,000 barrels a day in 2012. During a briefing in Washington on February 14, China's Deputy Foreign Minister Cui Tiankai dismissed US-led sanctions on Iran to force the Islamic Republic into freezing its peaceful nuclear program, stressing that Beijing intends to pursue its "legitimate economic interests" with Tehran. The United States, Israel, and their allies accuse Tehran of pursuing military objectives in its nuclear program with Washington and Tel Aviv repeatedly threatening Tehran with the "option" of a military strike against its atomic facilities. Iran argues that as a signatory to the Nuclear Non-Proliferation Treaty and a member of the International Atomic Energy Agency, it has every right to develop and acquire nuclear technology for peaceful purposes. Is Iran legally permitted to close Strait of Hormuz to countries that impose sanctions against Iran's oil?